Breastfeeding Rates, International and U.S.
For breastfeeding rates in the United States, go to http://www.cdc.gov , specifically to www.cdc.gov/breastfeeding/data/NIS_data/index.htm and find there the extensive U.S government statistics on this subject. To read about apparent effects of various breastfeeding rates on health outcomes of the breastfed children, presenting information that is not normally provided on this subject, go to www.pollutionaction.org . The chart below was downloaded from the website of LaLeche League International in May of 2012. 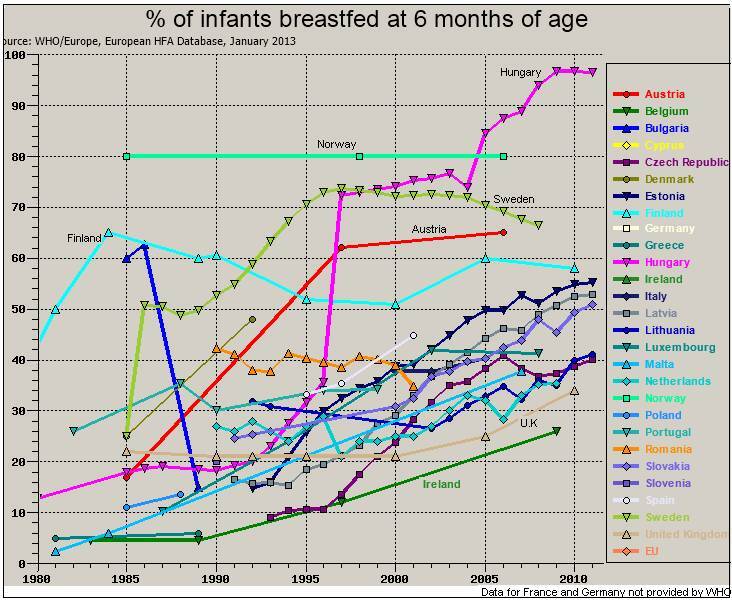 At the heading of the chart was “Breastfeeding Statistics September 15, 2003”, so the data may not be up to date. 3. Acta Paediatr 00-1;89(1):88-93 Cattaneo, A. et a. 4. Breastfeeding Rev 00-1;8(3):23-27 Donath. S. & Amir L.H. 8. JHL 96-3;12(1):37-39 Dickstein M. & Bordoux P.P. 13. AWHONN Lifelines 03-8/9;7(4):340-47 Banks J.W. Page last edited 2008-09-29 20:34:38 UTC. Copyright © 2008-2011 by La Leche League International and those posting information. All Rights Reserved. *To read about apparent effects of various breastfeeding rates on health outcomes of the breastfed children, presenting information that is not normally provided on this subject, go to www.breastfeedingprosandcons.info and www.pollutionaction.org . For information about Pollution Action, go to the second link just above.